A criminal conviction in New Jersey is a lingering problem, as it affects your life long after you serve your time, pay a fine, complete a diversionary program, or finish probation. Unfortunately, the reality of your conviction is just a background check away from hindering your job prospects, educational opportunities, and even volunteer activities within the community. A single mistake, unfortunate event, or troubled period should not have the power to adversely impact your life forever. Fortunately, through the process of expungement, you can essentially erase your criminal record and infinitely open-up the possibilities to come. New Jersey provides this one chance alternative to permanent stigmatization, allowing those who meet eligibility requirements to start fresh. An expungement may be one step away from pursuing your brightest future. Finding an attorney who can help you to navigate this complex process can be the most important decision you make moving forward. Attorney William Fay has extensive experience assisting clients with expunging their criminal records in Burlington, Camden, and Gloucester County, and throughout Southern New Jersey. His practice has been built upon responsiveness and engagement with his clients through every step of the legal process, while delivering superior outcomes. In fact, Mr. Fay has experience on both sides of the criminal justice system in New Jersey, as he is a former Deputy Attorney General for the NJ AG’s Office. He utilizes his extensive knowledge of the law to help clients obtain the expungements they seek and move on with their lives unimpeded by the past. Contact his offices today at 609-832-3202 to learn if you are eligible for an expungement and find the answers to your questions, all with a cost-free, no obligation consultation. 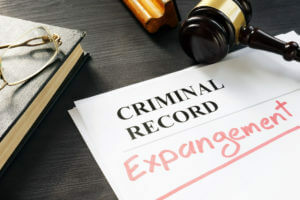 If you successfully obtain an expungement, your criminal record will appear clean when potential employers, educational institutions, or other interested parties run a criminal background check. This means that you can legally answer “no” to the questions “Have you ever been arrested?” or “Have you ever been convicted of a crime?” You can also successfully apply for and obtain a gun permit in New Jersey after your expungement petition is approved. The only exceptions to this rule are for those seeking employment in law enforcement, the department of corrections, the judicial system, or another part of the State or Federal government. There are certain time-sensitive requirements associated with expungements in New Jersey. Specifically, you can expunge an arrest not resulting in a conviction immediately after the charges are dismissed. If you are seeking an expungement after achieving a dismissal through completion of a diversionary program such as Conditional Discharge, Conditional Dismissal, or the Pre-Trial Intervention Program, you are eligible 6 months after you complete the program. If you are convicted of a municipal ordinance violation, you are eligible 2 years after the date of conviction, payment of fine, completion of probation, or the latest form of restitution. If you are convicted of a disorderly persons or petty disorderly persons offense, you will be eligible 5 years after the date of conviction, payment of fine, completion of probation, or the latest form of restitution. Lastly, if you are convicted of a felony offense, which is not on the list of excluded crimes (see below), you are eligible for an expungement 10 years after the date of conviction, payment of fine, completion of probation, or latest form of restitution. It is important to note that in certain cases, you may be eligible for an expungement after 5 years. This will require you to sufficiently demonstrate compelling circumstances to the court. To learn if you may be eligible for an expungement of your criminal record in New Jersey, contact our criminal defense law firm today at 609-832-3202 for a free consultation. Mr. Fay assists clients in Burlington, Camden, and Gloucester County, and throughout Southern New Jersey with obtaining expungements.